Girls. Girls. Girls. brings back a time when women in fashion were all about the polish, the luxury and the total fantasy. When fashion magazines were pure indulgence and envious aspiration. It promises to bring back some much needed escapism from a far too real world, photographically speaking. 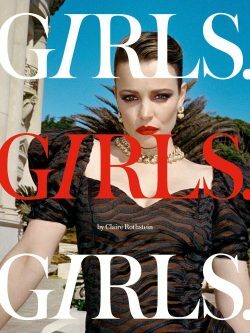 A new biannual publication from Carine Roitfeld (previously editor-in-chief of Vogue Paris) A celebration of fashion and creativity, irreverentin spirit and timeless in style. A platform for…..